With over four years to create a perfect cigar and more than 100 years to create a perfect legacy, the Padrón Family understands the significance of quality and time. Padron Cigars deliver only the finest, handmade and complex cigars with the flavor of the Cuban heritage out of which the Padrón recipe was born. Padron believes in the exceptional quality of their product and continues to reward its customers with a smooth cigar smoke. “Padron Cigar 1926 Serie No.35 Natural, Padron Cigar 1926 Serie No.35 Maduro, Padron Cigar 1926 Serie No.2 Natural, Padron Cigar 1926 Serie No.2 Maduro, Padron Cigar 1926 Serie No.9Natural, Padron Cigar 1926 Serie No.9 Maduro, Padron Cigar 1926 Serie No.1 Natural, Padron Cigar 1926 Serie No.1 Maduro, Padron Cigar 1926 40Th Anniversary Natural, Padron Cigar 1926 40Th Anniversary Maduro, Padron Cigar 1926 80Years Natural, Padron Cigar 1926 80Years Maduro. 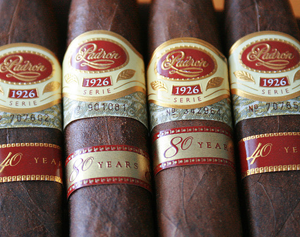 Padron Cigar 1964 Anniversary Exclusivo Natural, Padron Cigar 1964 Anniversary Exclusivo Maduro, Padron Cigar 1964 Anniversary Imperial, Padron Cigar 1964 Anniversary Torpedo Natural, Padron Cigar 1964 Anniversary Torpedo Maduro, Padron Cigar 1964 Anniversary Pyramide. Are you looking for Padron cigars near San Diego? We carry a full selection of Padrons and other cigars near San Diego, Mira Mesa (92126), Rancho Penasquitos (92129), Miramar (92145), Clairemont Mesa (92117), Del Mar (92014), Encinitas (92023-92024), Escondido (92025-92027, 92029-92030, 92033, 92046), Poway (92064), Rancho Bernardo (92128), La Jolla (92037-92039, 92092-92093) and the surrounding San Diego areas.